2013 release. For the uninitiated, the composer of this music is also a master craftsman who, throughout the 1980s, combined his off-the-wall ideas and sky high expectations using craft, experimental technology and a trusted team of participants to help concoct some truly bizarre local produce in mass quantity without compromise. Ilaiyaraaja, known to his family as Gnanadesikan, and to many of his zillion strong fan base as Isaignani (meaning musical genius in Tamil) represents the epitome of a nostalgic national treasure, especially for a single solo composer in the Tamil micro music industry. His euphoric electrified music of the '70s and '80s (and beyond) captures every essence of joy and jubilation and is still used in celebration as much as it is celebrated in its own right. A man of humble physical stature and sparsely equipped with a self-sufficient studio of compact electronic devices, Ilaiyaraaja literally commands celebration with his single-handed symphonies. Defying any fair comparisons in the Western world (besides inadequate parallels to Joe Meek and Jean-Pierre Massiera), it is also virtually impossible to find similar electronic mavericks in the East. Imagine a mixture between Turkey's Ilhan Mimaroglu and the acidic synthesizer ragas of Charanjit Singh and you're still left short of the songs. Essentially, Ilaiyaraaja is to the local Kollywood film industry what RD Burman/Bappi Lahiri or M.Ashraf/Tafo are to Bollywood and Lollywood, but then remember that Ilaiyaraaja is a one-man band, with a single vision and zero competition. 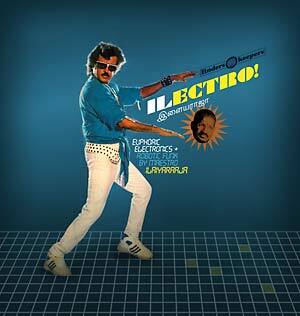 This compilation reveals more tasty treats from B-Music's ongoing obsession with The Crown Prince Of Tamil Pop -- focusing on his growth in the mid-1980s as a confident young composer adding freak pop fuel to the flickering flame of Kodambakkam's Kollywood film industry, while embracing domestic synthesizer technology and fusing the power of electro and synth pop to his Carnatic canon.